Unusual bushy shrub, or small tree, with weeping stems. 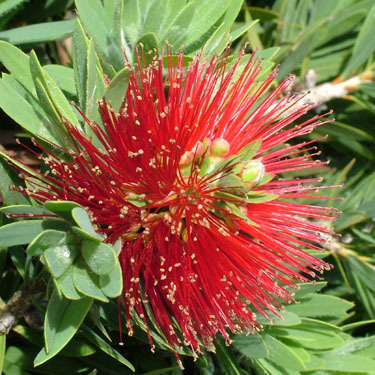 Stunning bright red flowers appear in spikes from late spring to mid-summer. Ideal for shrub borders, courtyards or any exotic planting scheme. They grow in neutral to acid, moderately fertile soil in full sun. After flowering prune back any shoots that spoil the symmetry of the plant. They will also tolerate hard pruning if a tighter, condensed shape is desired. Protect from very hard frosts.